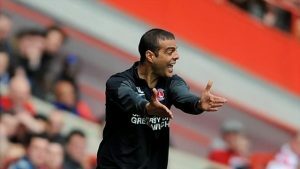 This week saw Charlton complete their fourth summer acquisition in the form of French born Ahmed Kashi. The Algerian international midfielder may not be too well known here in the UK but he has made a name for himself in French football. Making his debut in 2008 for French Ligue 2 side LB Chateauroux aged 19, where he played for four seasons before leaving at the end of his contract. He went on to sign for FC Metz in 2012, who were in the 3rd tier of French football at the time. He played a part in Metz’s promotion to Ligue 2 that same season, before becoming an integral part of their side the following year when they completed back to back promotions, being crowned champions of Ligue 2. In January 2015, he was called into the Algerian national squad for the African Cup of Nations. He made his debut for his country as a late substitute in a crucial 2-0 win against Senegal, securing their progress to the knockout stages. Before signing for Charlton, I’m sure he has done a lot of research on us, leaning on his Algerian captain and fellow Charlton centre half Madjid Bougherra. So what can we expect from our newest recruit? Kashi has been used solely as a defensive holding midfielder during his career. With just four goals in 176 appearances, do not expect to see Kashi breaking into the opponents’ box on to many occasions. What we can look forward to though is a tough tackling, no nonsense, all action approach that has made him a firm fan favourite at his former clubs. His arrival at Charlton adds to an already competitive position, with Cousins, Ba, Jackson and Diarra already fighting over two starting places. Luzon appears to be recruiting with one eye on physicality this season and this signing is no different. I for one, just hope we can see a little creativity added to our ranks in the coming weeks, or else we may be in for long hard season with more draws than victories.